Although I received lots of offers of help to solder the components together the guys at work told me I’d have no trouble doing it myself, so I decided to try. First I ordered the soldering kit (iron, solder, stand, helping hands, solder sucker) from eBay and a practice board to train myself with. The ‘helping hands‘ turned out to be worth their weight in gold. 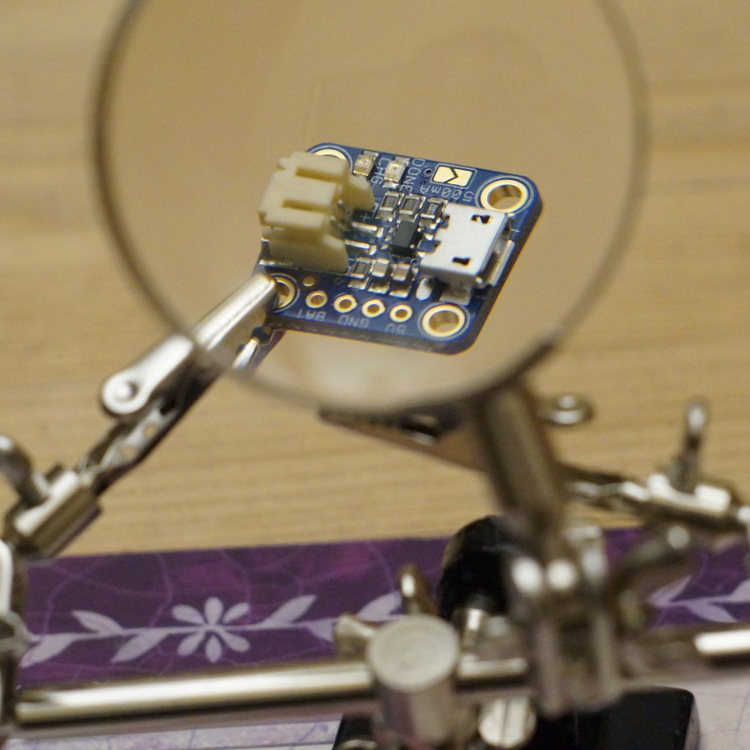 I soldered my first pin, inspected it and then soldered three more, choosing to solder them right next to each other as it seems that a common problem for amateurs is putting too much solder on. With four pins soldered I tested everything for continuity issues, to make sure no excess solder had spilled on to the adjacent contacts and shorted anything out. 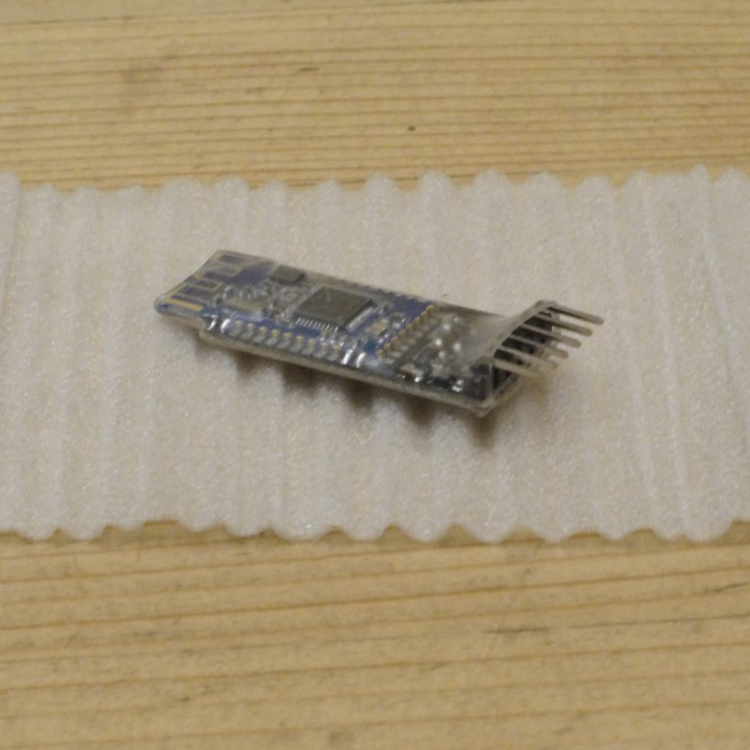 My AdaFruit LiPo-charger came with a connector, my battery came with a connector; they weren’t the same. First job then was to cut the wires from each and solder the battery wires to the LiPo-charger connector. 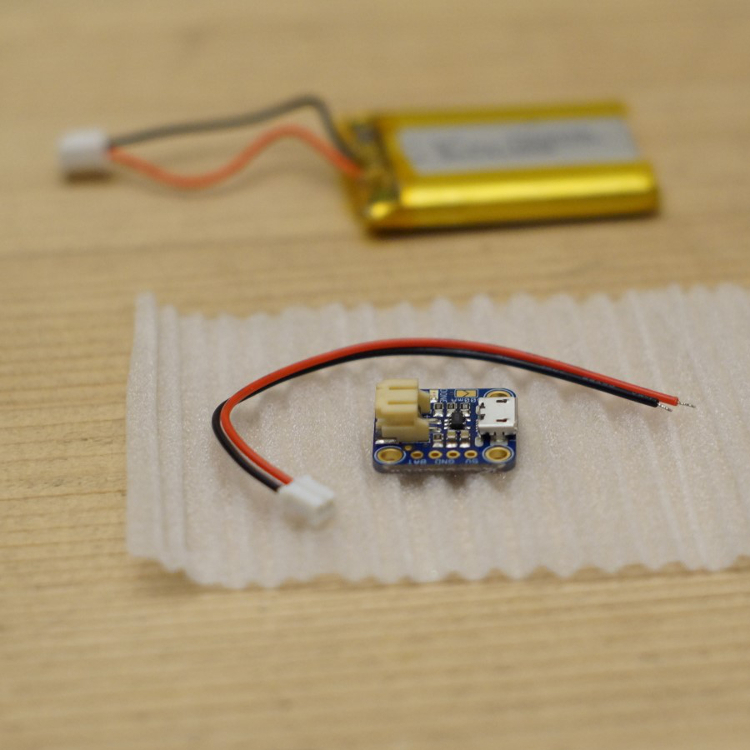 NOTE: some people remove the connector terminal on the LiPo-charger and solder directly onto the charger board, I didn’t fancy this as I like to be able to disconnect batteries and swap them easily. DO NOT connect battery to LiPo-charger. The AdaFruit Li-Po battery charger then needed a power (red) and ground (black) wiring up. For my first try I soldered a four-piece-header-pin to the board and used jumper wires to connect to it, but within a week I removed the header pins & soldered the wires directly onto the PCB. 1. Red wire, solder on to 3.3v (marked as BAT on mine), first on the left as we look at that board. Make sure you don’t solder on to the 5v connector. 2. Black wire, solder on to one of the GND connectors, for ease I chose the 3rd from the left. Prepare four wires (red, black, green, blue) with one female header pin at one end and bare wire for soldering at the other. 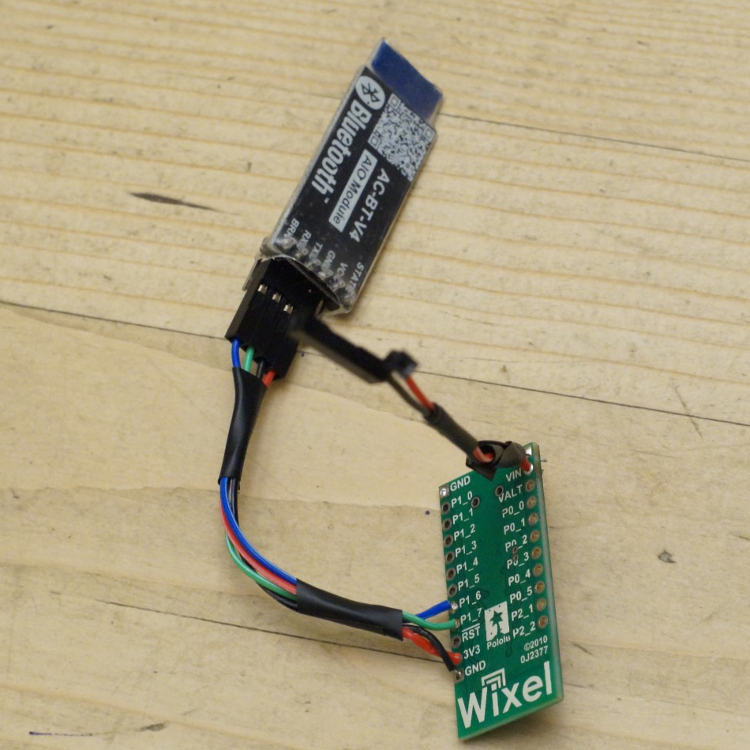 Other possible options: The header pin option is the simplest way to connect from WIXEL to HM-10. 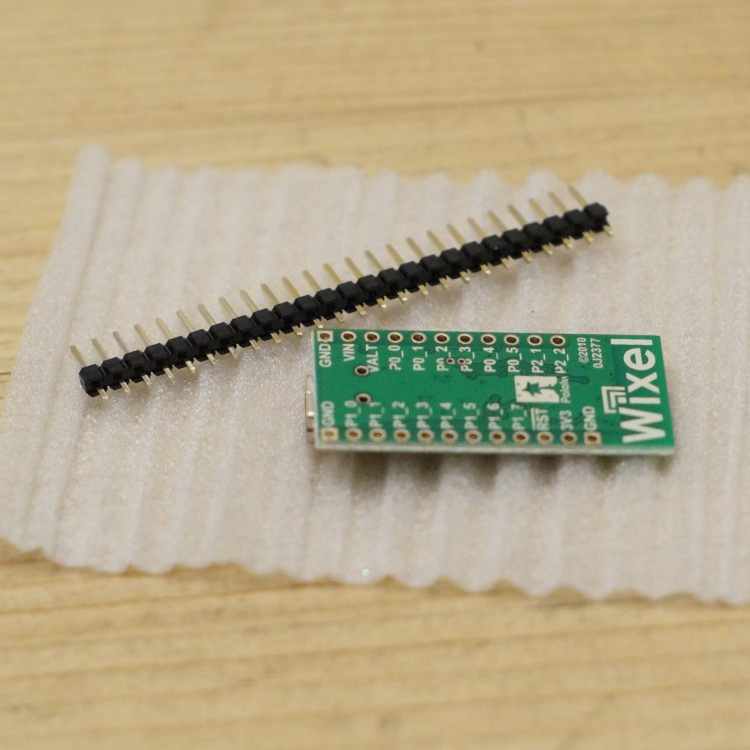 The hardest (but not too bad) option is to desolder the HM-10’s header pins, then solder wires with two bare ends onto the WIXEL and to the HM-10. 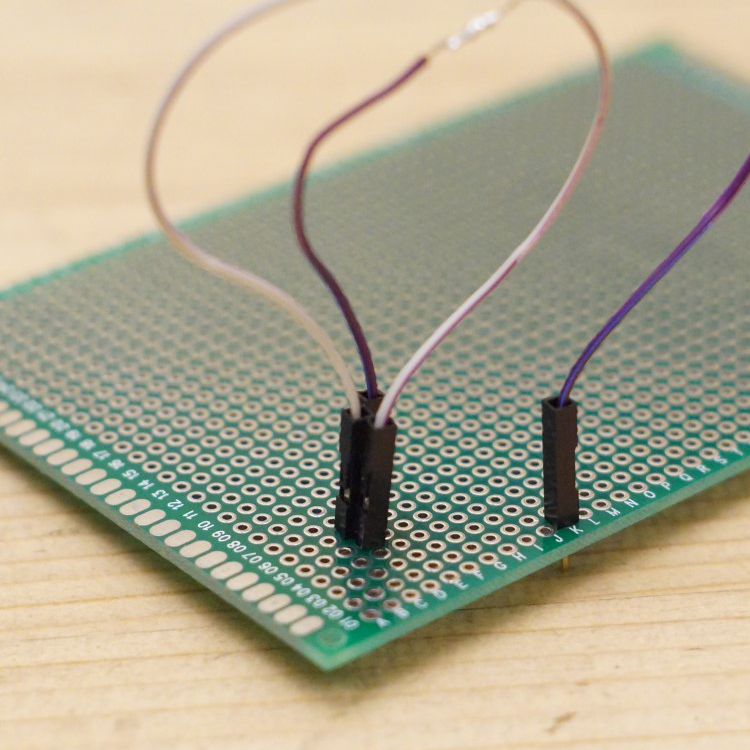 The middle option is to solder wires with two bare ends, one end onto the WIXEL and one bare end onto the relevant header pin on the HM-10. Whilst this might seem easy I think it’s simpler to desolder the HM-10s header pins as above. If you soldered wires with female header connector at one end when you did the step above then all you need to do next is to slide the correct colour wire’s connector onto the correct HM-10 pin as per the diagram here. If you soldered wires with two bare ends and left the header pins on the HM-10 then you need to solder the bare wire ends to the correct HM-10 header pin as per the diagram here. This is tricky to do (for me) but not impossible as I found when I made a second xDrip. I choose to wrap electrical tape around each soldered pin/wire afterwards. If you soldered wires with two bare ends and removed the HM-10 header pins then just solder the bare ends onto the HM-10 as per the diagram here. 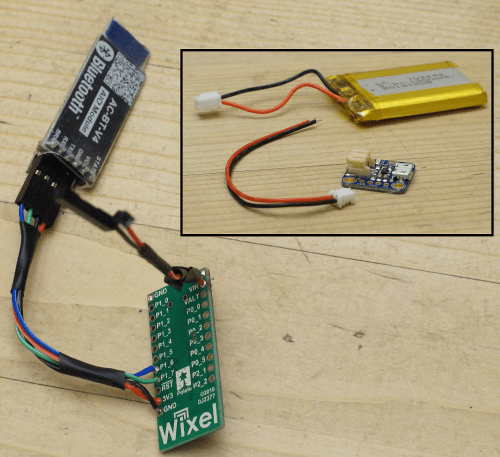 With the LiPo-charger disconnected from the battery (and micro-USB power) you now need to solder its wires to the WIXEL. Note: the picture shows header pin connections for the AdaFruit Li-Po charger but I’ve now soldered the wires directly to the board, it now has a much smaller footprint. Okay, I’ll own up, I know I shouldn’t be so excited about this but I am. This is a game changer, for us and many, many more. It proved its worth within 24 hours when I saw Amy was hypo whilst sleeping (see below). 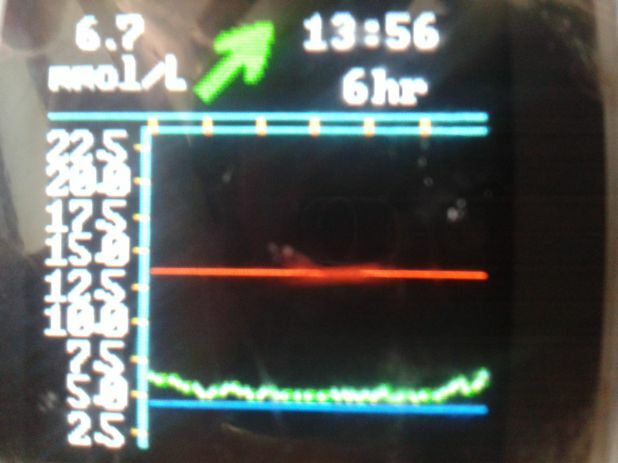 Amy wouldn’t have woken up and tested her blood glucose for another 4 or 5 hours but by having xDrip working I saw that she needed some glucose tablets to raise her blood glucose levels. 5 minutes later she was back asleep…for four more hours. #Teenagers! xDrip is a combination of a device and a software application which receives data sent out by a Dexcom G4 CGM transmitter/sensor and displays the glucose readings on an Android phone. The app can also upload it’s data for use by Nightscout, which in turn means glucose readings are available on the internet via a PC/Mac, phone or even a smart watch (Pebble etc.). 1. 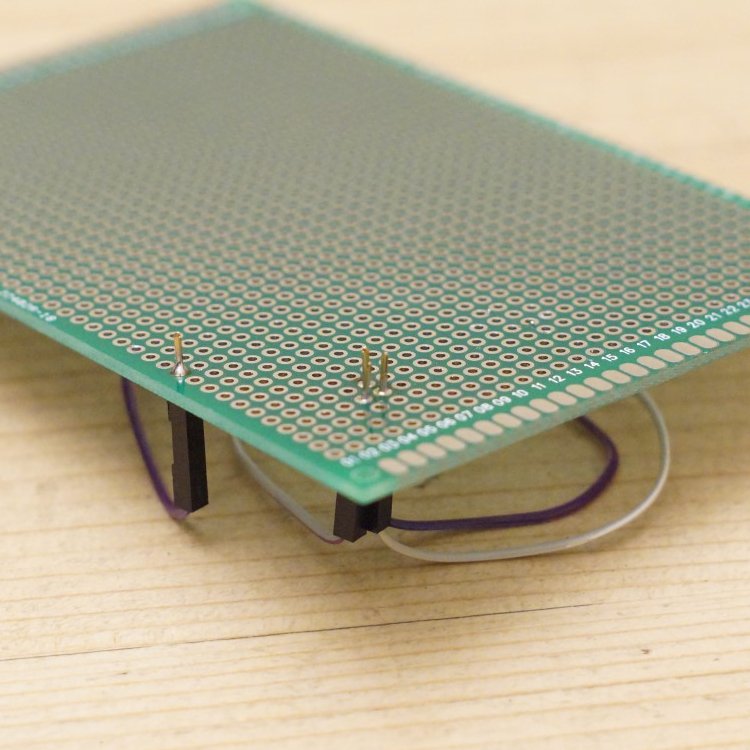 The first is a do-it-yourself device, made up of four components which you can buy off the Internet and solder together. Total price is about £40 including battery. (That’s a partially made device on the right). 2. 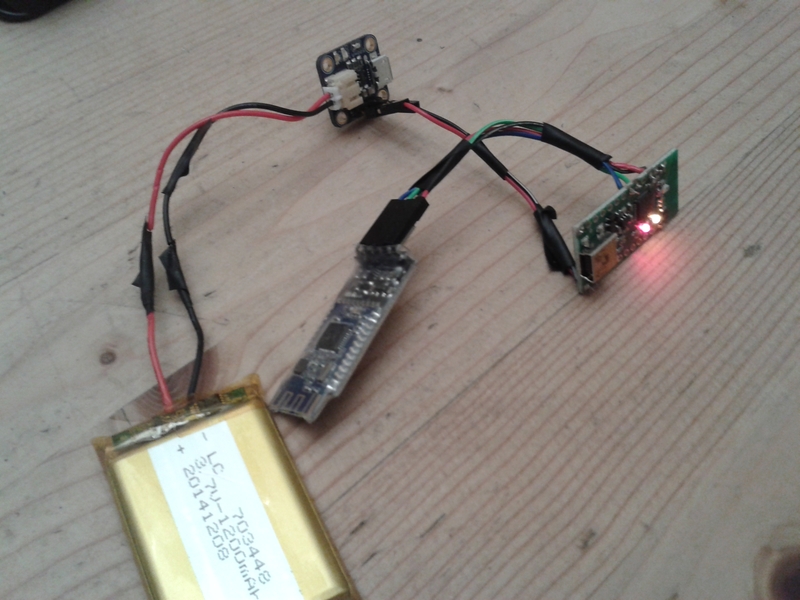 The second is the xDrip application which runs on Android phones (4.3+above with Bluetooth Low Energy (BLE) support). The app uses the xDrip device to read the output from a Dexcom CGM (continuous glucose monitor) sensor/transmitter. xDrip links up to existing Nightscout databases. The xDrip app can feed the data to a Nightscout database, which in turn means the data can be accessed via the Internet practically anywhere, using a PC/Mac, laptop, smartphone (Android/IOS/Windows) or better still a SmartWatch. Wait! What? Nightscout? BLE? CGM? Dexcom? Animas? Okay, it’s probably a good time to go over some of the common words I’ve used in the article. I’ll presume you’re already aware of insulin, insulin pumps, glucose levels and the world of Smartphones. Animas – Animas is a company that makes insulin pumps. My daughter Amy has been using one of their pumps – called the Vibe (yeah, yeah, I know!) – since since June 2013. We chose the Animas Vibe specifically because of it’s use of Dexcom’s CGM system, although it turned out to be a whole year before we got the chance to use CGM. BLE – is a version of the Bluetooth communication protocol which uses a low amount of energy, which means devices can work for longer without charging. Android has built-in support for BLE from version 4.3 onwards. CGM – Continuous glucose monitor. A device which regularly samples the glucose level of its wearer, sampling the glucose in the interstitial fluid, not the blood. If you’re new to CGM perhaps take a look at this blog of mine: CGM: we’re live with Animas/Dexcom. CGM-in-the-Cloud – is a term for any CGM which can be connected to a web site to allow for remote monitoring of someone’s glucose levels. It’s pretty big in USA, not so much over in Europe. A big player in this is Nightscout (see below). Dexcom – Dexcom is one of many manufacturers of CGM systems. We use Dexcom because it’s linked with Amy’s Animas Vibe pump, if we’d got a Medtronic pump we’d use their Enlite CGM system. One benefit of Dexcom’s CGM appears to be that the sensors last longer – which is a big thing for us (who pay for CGM ourselves) as it lowers the total cost of using CGM. For the record I don’t believe Dexcom is any better than the new Medtronic Enlites. Nightscout – Nightscout is “an open source, DIY project that allows real time access to a Dexcom G4 CGM from web browsers via smartphones, computers, tablets, and the Pebble smartwatch. 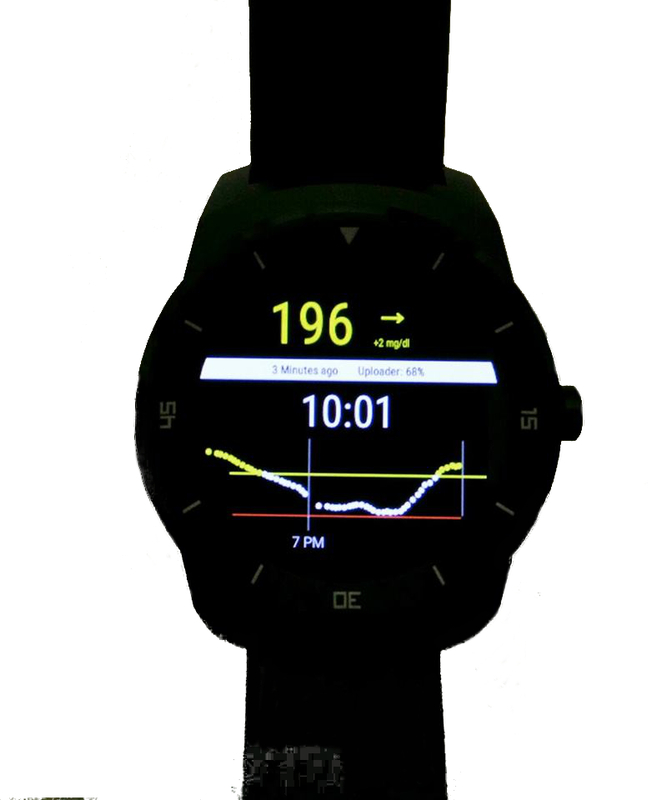 The goal of the project is to allow remote monitoring of the T1D’s glucose level using existing monitoring devices.” In short Nightscout and the people behind it are awesome. Who should we thank for xDrip? xDrip is the brainchild of Stephen Black, who was recently diagnosed with Type 1 Diabetes. With the help from others in the CGM-in-the-Cloud community Stephen has designed the xDrip device and written the software. I think he deserves a big round of applause. 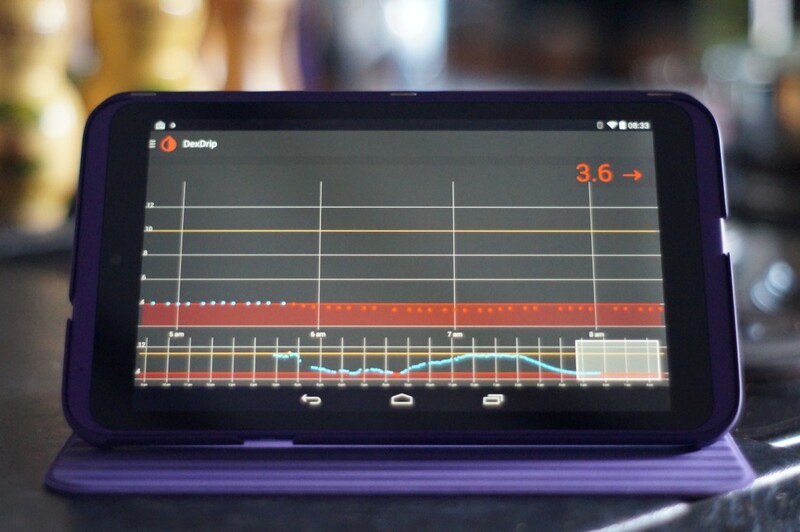 The xDrip app (on Android phone/tablet) controls the xdrip device to listen for and receive the Dexcom data. If required the app can upload the data to a Nightscout database. We didn’t do this initially but set it up within the first week. If using Nightscout parents (etc.) can view Nightscout info on a PC/website/smartwatch, like on the right. I’ve seen some great pictures of parents looking at their kid’s glucose level being displayed on the parent’s Pebble watch whilst the kid does some activity with their friends. A further step is the use of another Android/smartphone application named Nightwatch, also written by Stephen. It relays information from the Nightscout data onto a secondary phone and potentially on to a smartwatch. That’s Stephen’s SmartWatch above/right, showing the glucose levels on mg/dl (so don’t panic UK people). Dexcom G4 CGM system, including transmitter and sensors. An Android phone or tablet running version 4.3 or above and the ability to use BLE. Components for the xDrip device (Wixel (£14), LiPo battery (£6) and charger (£6), BLE module (£15) and some wires to link it all together. A soldering iron or a friend/relative with one. I bought one off eBay for £12 including the iron, solder, iron stand/sponge and magic hands with magnifying glass. A bit of patience. I didn’t have any but on reflection it would probably be a good thing. 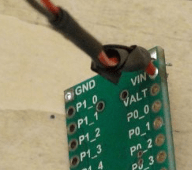 In this next blog I detail the components I bought, which are pretty much the same components Stephen Black (the creator of xDrip) used. Is this really a do-it-yourself project? Before starting on this project I had never soldered any electrical components, I even had to buy a soldering kit specifically for this. Fair enough I program computers for a living but in this case my knowledge actually hindered my progress as I looked for a complicated solution to a problem I didn’t actually have. Luckily Stephen was on hand (via Twitter) to help me through it. Soldering wise I’d say I spent a couple of hours in elapsed time making up the device, but that’s only because I was taking it very slowly to make sure I got nothing wrong. I’d imagine anyone with soldering experience would have this done in a few minutes. If you don’t feel you can solder the components together why not ask a friend, relative or colleague? With the xDrip device in Amy’s room, we checked that our tablet’s xDrip app could communicate with it when in our bedroom and also when downstairs in the kitchen; it could. At 7am I woke up and went downstairs, taking the tablet with me but not looking at it, placing it on charge in the kitchen, underneath Amy’s bedroom. I heard a noise and presumed it to be a mobile getting a Facebook notification or something. Then it happened again. I realised it was Amy’s Animas Vibe pump vibrating to tell her that something wasn’t great, it was right she was low. Amy was fast asleep with the pump lying on the mattress beside her, she couldn’t feel it, it didn’t wake her. On the other hand I was in the room underneath and heard it, the vibration going through the mattress, down the bed itself, onto the floorboards, through the joists and onto the ceiling below! So I checked the tablet and saw the image on the right. I waited 10 minutes to see if her level improved – it didn’t – and went up to wake her to give her a few glucose tablets. Amy went straight back to sleep, I went downstairs happy that she was no longer in danger. Twenty minutes later I was pleased by the 5.5mmol showing on the xDrip app. In the middle of a busy weekend – clinic yesterday, TeamBloodGlucose cycle ride tomorrow – Amy and I had an invite to the second SweetMeet organised by the team at Portsmouth’s QA hospital. For us it was another privileged invite being personally invited by Dr Partha Kar for the second year running. Amy and I met Laura and Tanwen as soon as arriving, then with a breakfast bacon butty in hand had a nice chat JDRF’s Sue and DRWF’s Lee. Helen the pump rep from Roche was there and to our surprise our Animas rep Emma arrived, pleased to see Amy and to hear that she was getting on well with her Dexcom CGM, which Emma trained us in only two weeks ago. It’s really lovely coming to events like these and knowing so many people, it’s like one big family. SweetMeet2 was officially opened by Lisa who referred to herself as just a nurse before introducing the team who had given up their spare time. With the plan for the day read out Dr Partha Kar stepped up to start the day off, but before doing so he praised lead nurse Lisa for the dedication and hard work she puts in keeping the department running. Next up it was time to speed date with the professionals, with the audience staying at their tables and professionals moving around the round to ask/answer questions during each 7 minute slot. Seven minutes goes very quickly when questions are being asked and it’s amazing how much you can cover during that time. The podiatry and retinopathy sessions explain a lot about the processes that we know very little about and gave answers about what you should expect (nerve tests on bottoms AND tops of feet) and by whom (GP surgery nurse). Partha did a session and an important message came across: people can and should help themselves, a message I’ve lived by since discovering the #DOC (Diabetes Online Community). The bigger question though is how to get those not already engaged to become so as those at the SweetMeet were clearly engaged already. My favourite speed date – this sounds awkward 🙂 – was with Dr Iain Cranston, who chatted about Abbott’s Flash Glucose Monitoring, something I’m looking forward to being announced officially in September at EASD in Vienna – like many I’ve had an invite to go but can’t quite justify it. It has the potential to revolutionise finger-stick tests as it promises to do away with them, instead relying on swiping a NFC device across a sensor which is changed every two weeks. I didn’t think much of this technology initially but when I realised that it stores the last 8 hours of tests I realised it could be used as a non-alerting CGM, which is just fantastic. Fantastic that is if Abbott pitches it at a price to rival meter strips. Breakout session 1: are all carbohydrates equal? This year saw the introduction of two breakout sessions, with Amy and I going to the one of carbohydrates. Starting off with some simple carb-counting we moved on to GI which raised some interesting discussions, based bolusing for low-GI and wave bolusing techniques for pump users. It was the first time I’ve been able to talk sensibly with a dietician about LCHF (low carb high fat) diets, their effect/usefulness and more importantly whether they’re suitable for kids, or can be adapted to be so. Dr Iain Cranston held our second breakout session which started with us all stating the new developments we wanted to know more about. With islet transplants and stem cell research already on the board (two things which could go hand in hand to get people off insulin) I offered a couple of other things: smart insulin and inhaled insulin. Dr Cranston’s knowledge of developments is great and filled us all in on each of the developments, answering my questions about beta-cell replacement whilst super-T cells still exist. How often do you get the chance to ask questions like this, that’s the beauty of something like the SweetMeet. I have a feeling that if the allocated time hadn’t run out Dr Cranston and I could have chatted about stuff like this for hours. Lee Calladine, spoke about his life with Type 1 diabetes which he was diagnosed with aged 33. As DRWF’s Event Organiser Lee organises events such as the DRWF Wellness Day South which I attended two weeks ago as well as last year. Lee’s message fitted in nicely with Partha’s: educate yourself, find out about your diabetes and your gains will be great. Since educating himself Lee feels more in control, has got his HbA1c lower and minimised his risk of complications and that’s something we all want. The second SweetMeet was a huge success in my opinion and Sue, one of QA’s dieticians, should be thanked by all who attended for organising a great event. Well done Sue, we really enjoyed it. At last year’s event Amy won a bottle of champagne in the carb counting quiz, which of course was commandeered by myself and consumed shortly thereafter. With high hopes she entered this year’s quiz and alongside a few others won another prize, this time a set of Rosemary Conley Nutritional Scales which will hopefully be very useful for carb counting.